Sharp and sensual, Roxie and Fred is a provocative love story that explores a May-December relationship. Is it ever too late to fall in love again? On her way into her eighties, Roxie is in a contemplative phase. She has had her share of husbands, children, and life’s demands, and has now retired to her artist’s studio, where she lives alone, doing yoga and painting. She thinks her romantic days are over, until she meets Fred. A recent empty-nester who’s dipping into watercolors, Fred at first sees Roxie as a mentor, guide, and fellow artist. But soon, it is apparent that their attraction to each other is more than just cerebral. Roxie’s attractiveness is emphasized; her skin is “aged but supple and smooth like fine oiled hide.” Her vegetarian diet, daily yoga, and creativity have kept her young. Fred’s attraction to her is less taboo because of her youthfulness, and so there is a missed opportunity to push the envelope in their relationship. 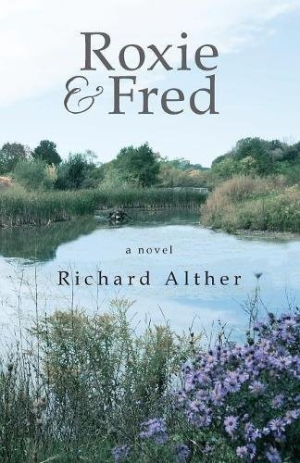 Richard Alther’s technical knowledge of art, painting, and composition pervade the novel, adding another expressive layer. Roxie and Fred have an eclectic, quirky mode of speech that can be hard to follow at times, and wordplay sometimes gets the best of the scene. Roxie and Fred depends heavily on internal monologue; the first two chapters are exclusively the main characters’ ruminations. The story picks up once the romance begins. Art becomes a bridge between two very different people, who yearn for connection. For Roxie, it’s the last love affair of her life. For Fred, it feels like the very first time. Roxie & Fred is a sweet, sultry romance that shows how desire based on intellectual attraction trumps disparities of age and experience. These artists’ affair is definitely one to remember.